Recent advances in machine learning and artificial intelligence methods have enabled the development of new tools for the quantitative analysis of cardiac performance in medical imaging examinations. However, applications to patients require implementation and evaluation on industry platforms. 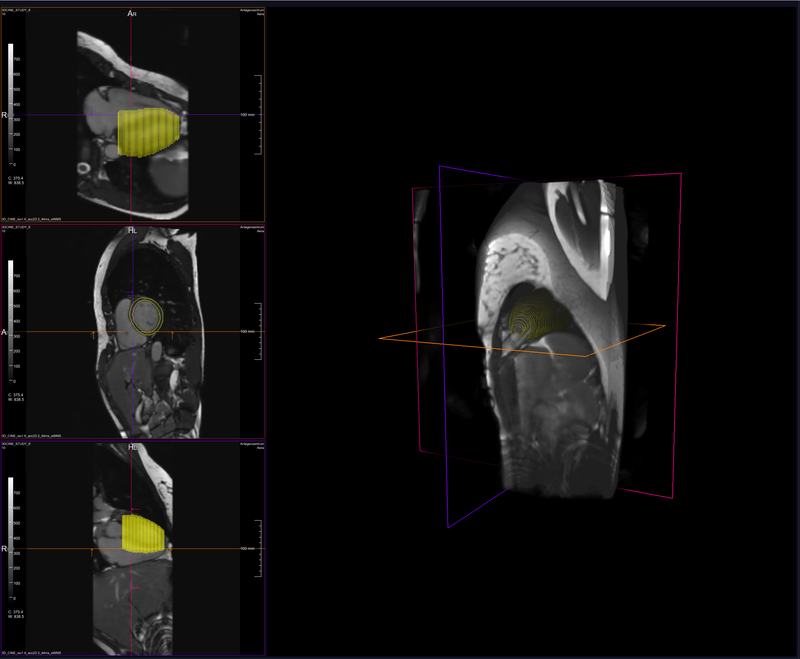 This project will develop new methods for the visualization and analysis of 3D+time cardiac MRI exams, using the Siemens Frontier prototyping platform. This platform is available at King’s College London through existing collaborations with Siemens Healthineers, and is built on the MeVisLab suite of visualization and analysis tools. This mechanism provides a pathway to translation of the resulting methods into clinical practice. The resulting app will become available to Siemens researchers and customers worldwide through the Frontier app store distribution mechanism, with the goal to become part of the Siemens product suite. The current clinical standard MRI method for evaluating cardiac function consists of multiple 2D cine breath-hold scans . Since each acquisition is performed in a separate breath hold, the slices are often mis-registered due to different breath-hold positions. Also, these acquisitions require complex planning and many patients cannot perform the multiple breath-holds required. Recently, advances in sparse sampling and parallel imaging have led to the development of respiratory gated 3D cine acquisitions [2, 3]. These do not require complex planning or patient compliance with breath-hold instructions. There is improved isotropic resolution and all regions of the heart are evenly sampled. However, current analysis tools have been optimized for the current standard 2D acquisition protocol and there is a need for robust automated analysis of the large amount of data resulting from these new 3D cine acquisitions. This project will leverage recent advances in machine learning and artificial intelligence to automatically analyse 3D+t data, providing information on shape and motion of all four chambers of the heart. Transfer learning techniques will be investigated to enable existing neural networks trained on standard acquisitions to be adapted to the 3D+t analysis problem. Schulz-Menger, J., et al. (2013). "Standardized image interpretation and post processing in cardiovascular magnetic resonance: Society for Cardiovascular Magnetic Resonance (SCMR) board of trustees task force on standardized post processing." J Cardiovasc Magn Reson 15: 35. Wetzl, J., et al. (2018). "Single-breath-hold 3-D CINE imaging of the left ventricle using Cartesian sampling." MAGMA 31(1): 19-31. Feng, L., et al. (2018). "5D whole-heart sparse MRI." Magn Reson Med 79(2): 826-838.